Once, on Prince Edward Island, someone fed me asparagus and cheese sauce on toast. I had a boyfriend whose mother was from the Island, and maybe it was one of his relatives. I can hardly remember anything about that trip – it was maybe 15 years ago – except that it was Easter and it was cold and snowy and someone fed me asparagus and cheese sauce on toast. 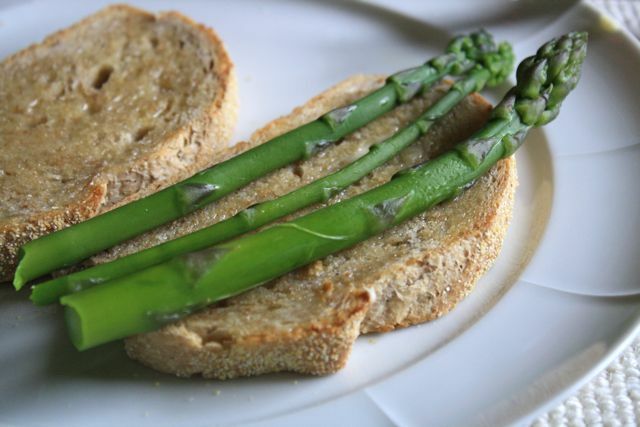 I mean, I had heard of each individual thing: asparagus, cheese sauce, toast. But I had never heard of putting them together and then eating them with a fork and knife for dinner. I remember going home and making it a couple of times at my little apartment in Halifax where I was studying. And then I don't remember ever making it again, even though I obviously liked it. But this week in my Prairie city, that is almost as far and as different from Halifax and Prince Edward Island as you can get in Canada, I thought of it again. We had half a bunch of asparagus sitting in the fridge and no plan for dinner. I suddenly remembered putting asparagus and cheese sauce on toast back on the east coast (rhyme not intentional). As a good western boy, Scott had never heard of such a thing, but he was game. Twenty minutes later – bread toasted, asparagus steamed, cheese sauce whipped up – we were eating dinner and happy as (PEI) clams. I made the recipe up out of my head because this is not a complicated business. I did try to look it up on the Internet to see if there was some quaint Island name I could attach to it. 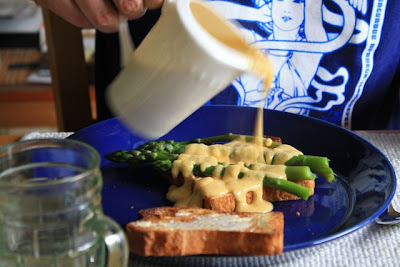 I found absolutely nothing related to asparagus and cheese sauce on toast and Prince Edward Island. So, as Anne Shirley would say, the name for this dinner is plain prose and not poetry. P.S. If you're from PEI and you know what this is properly called, could you please tell me? Start by making the cheese sauce. Melt the butter in a medium saucepan over medium-low heat. Whisk in the flour and let it simmer for 1 – 2 minutes to cook and bind together. Slowly whisk in the heated milk. Turn the heat up to medium and bring to a simmer. Simmer for a minute or two until it's thickened somewhat. Whisk in the cheese a bit at a time until it's incorporated. Add salt and pepper to taste. 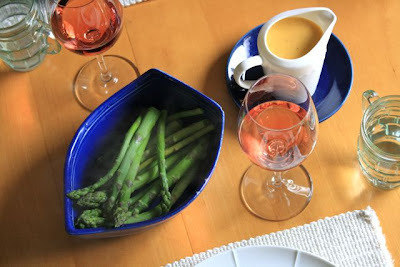 In the meantime, put the asparagus in simmering water and cook until bright green and tender. Alternatively, steam it until tender. 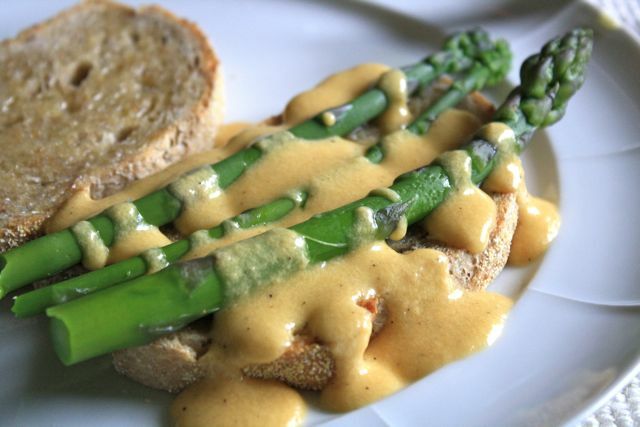 Set the table with butter, asparagus and cheese sauce. 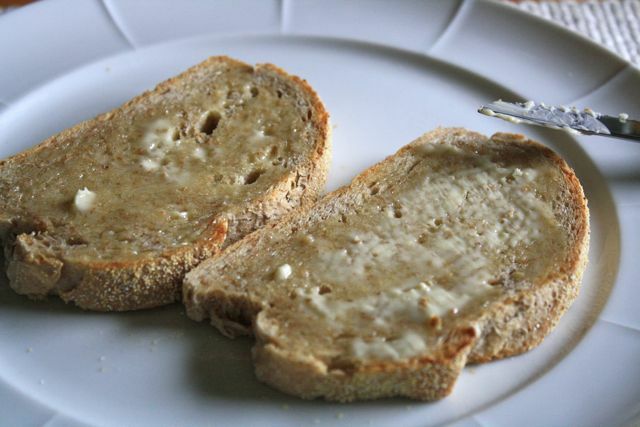 Butter your toast. Lay the asparagus on top. Pour cheese sauce over to taste. Eat. *If you don't have any sweet rice flour, you can use white or brown rice flour but your sauce won't be quite as smooth. Interesting ... I have never heard of such a dish either, and I'm from PEI (or pretty close). But it sounds delicious. 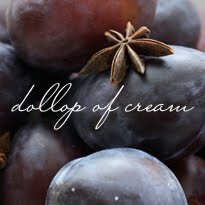 I love it -- especially the way it rhymes! My family has been eating this meal as far back as we can remember. My great grandma used to make it for her family. And my grandpa passed it on down to us. My grandpa grew up on a farm in Sask and we wondered if it was traditional in the prairies. (we're west-coasters now). We have it as our family brunch a few times a year when we all get together. Out of curiosity I just tried Googling it to see if other people eat this delicious meal and was thrilled to find your post. 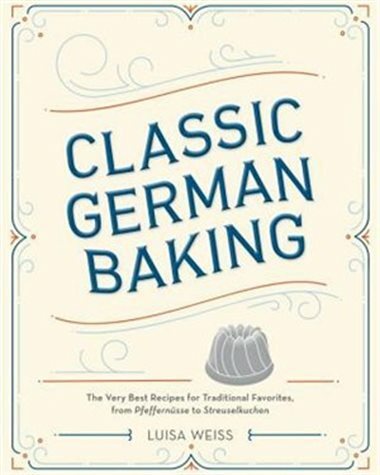 Your picture looks almost exactly like our recipe. So glad someone made it for you and that you remembered it and made it for yourself. What a great story! It seems like this is a cross-Canada dish now . . . I wonder where else it will surface?